Around the world, traditional retail is being encroached upon by e-commerce startups. As the online and offline worlds fight it out for a share of the customer’s wallet, the battleground can be found on social media. Retail chains are coming up with new strategies and adapting to declining organic reach in order to engage their audience and find new customers. For this report, Unmetric looked at the top 15 online and offline retail chains in Australia by the number of fans on social media. Data was analyzed from 2013 to the second quarter of 2017 to uncover seven trends impacting the industry. The retail chains featured in this report are as follows. Where is the Growth on Social Media for Australian Retail? Retail brands have the largest average audience size on Facebook — almost twice as large as Instagram. Brands have continued to grow their audience size at a brisk 6.4% in the first half of 2017, indicating that the social network should remain the primary focus for brands for the foreseeable future. Instagram has been building a reputation for allowing retail and fashion brands to reach the millennial and Gen-Z audience. This is perhaps why the growth rate is the highest on this social network. With the lowest audience growth rate for brands, Twitter appears to be fading away, which is confirmed by many trends identified in this report. How to Quickly Boost Your Instagram Engagement? In 2017, the average Australian retail brands on Instagram generated 1,060 interactions per post. As many as 30% of these posts do not contain a hashtag. 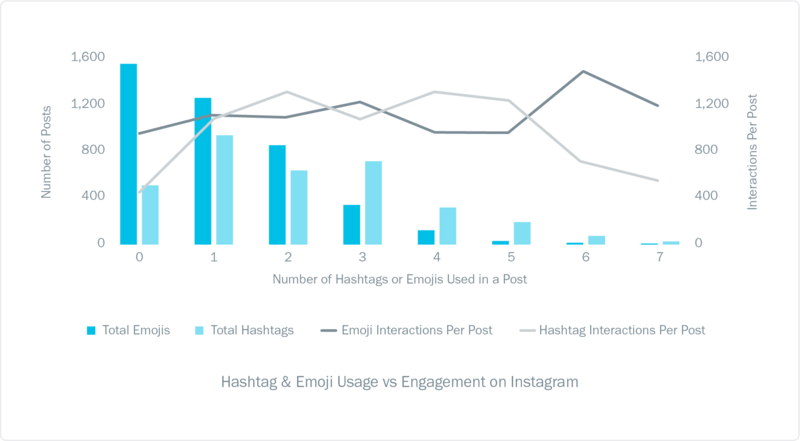 Our analysis found that brands could easily increase the number of interactions by an average of 10% by adding hashtags to their posts. Posts which included two hashtags saw 27% more interaction than average. 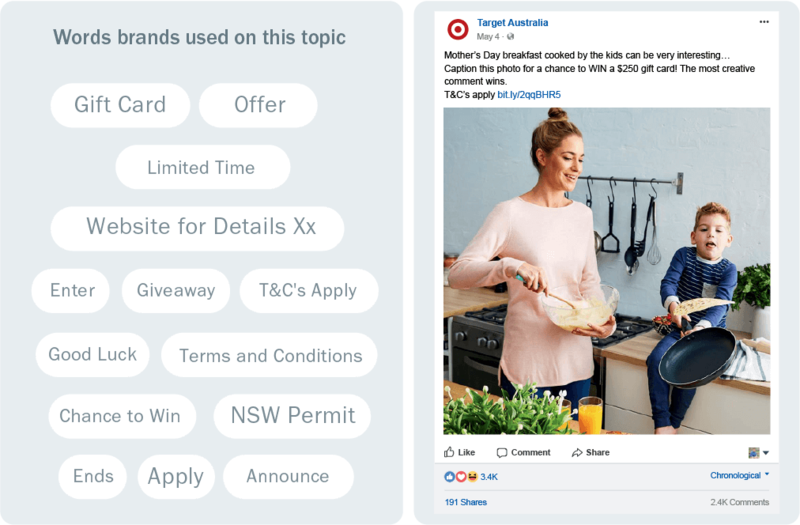 Another easy way that Australian retail brands can boost their engagement is by using emojis. 63% of posts by these brands included one or more emoji. When an emoji was not present in the content, a post generated an average of 949 interactions. When emojis were used, this jumped to 1,107 interactions per post. The optimal number of emojis in a post in terms of interactions was found to be three. 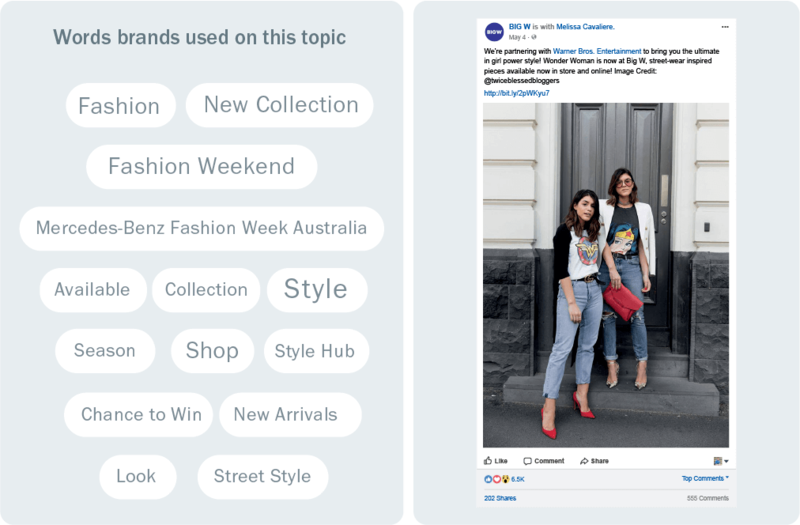 What are Australian Retail Brands Talking About on Social Media? To answer this question, we used Unmetric Discover, a searchable database of over 500,000,000 pieces of brand content published over the last five years. The four most popular topics are shown here. The most popular topic for retail chains in Australia was Seasons. 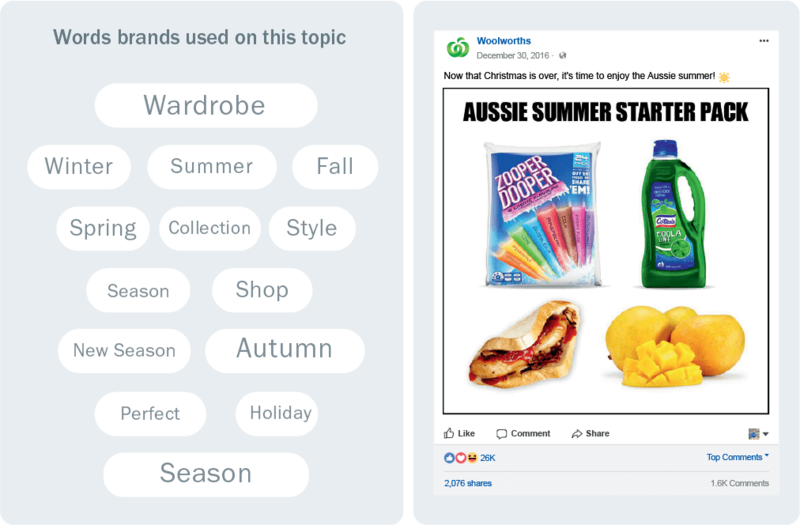 Woolworths’ organic post about the “Aussie summer starter pack” generated a lot of engagement with over 26,000 reactions. Displaying delicious food helped several brands grab attention and engagement on Facebook. With close to 600,000 views, Cole’s post on turmeric chai latte was shared more than 1,900 times. Seasons were an exceptionally popular talking point for retail brands around the world as entire campaigns could be built around them. New collections were also popular, and many brands had something to say around Australia Fashion Week. Promotional offers worked well for retail brands, particularly when they encouraged user generated content. New collections was the third most popular topic for retail chains. Big W’s organic post about their partnership with Warner Bros Entertainment received 6,500 likes. Most brands used contests, giveaways and sweepstakes as strategies to engage their fans. Target, who encouraged followers to post creative captions for the Mother’s Day image shown above garnered 2,493 comments. Since Q3 of 2015, retail brands have been publishing less and less content across social networks. At its height, brands were publishing an average of 4.7 pieces of content each per day on Facebook, Twitter and Instagram. In Q2 of 2017, this dropped to an average of 0.61 pieces of content per day. The social network that has been affected the most from this drop in brand content is Twitter. This excludes retweets and brand replies to tweets. Brands now publish 64% less content on this social network than they did in 2013. 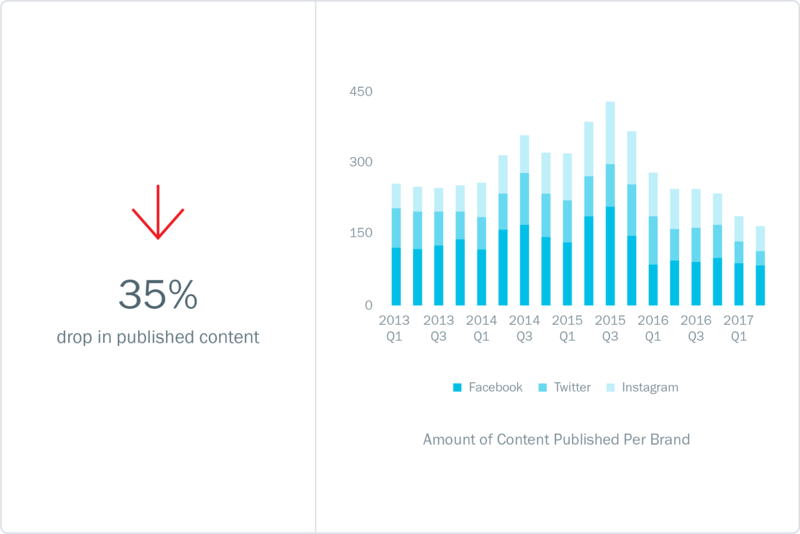 In 2015, brands had doubled the amount of content they published on Instagram compared to 2013, but this has now fallen back to 2013 levels. 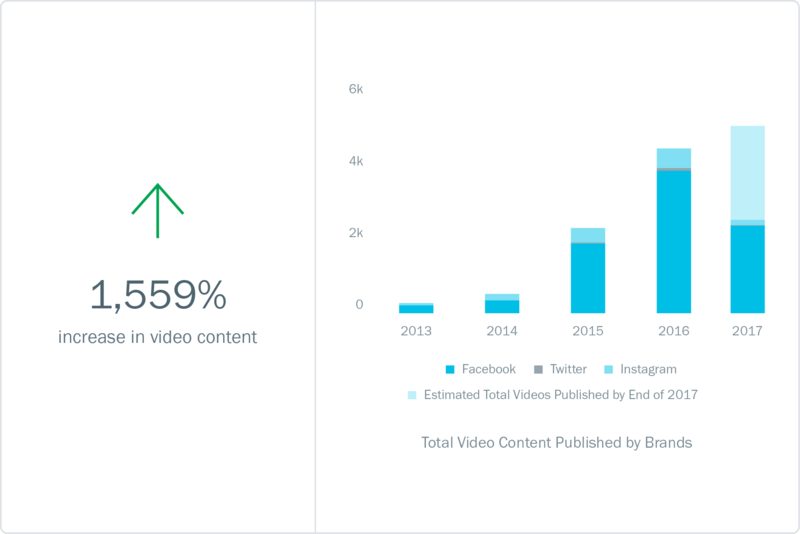 While brands are publishing less content than ever on social networks, they continue to double down on the production of video content. Indications are that 2017 will surpass 2016 in terms of total videos published. Every social network analysed has seen a rise in the amount of videos being published. The reason for the rise in video content shouldn’t be a surprise for any social media analyst: videos generate greater Reach than other post types. 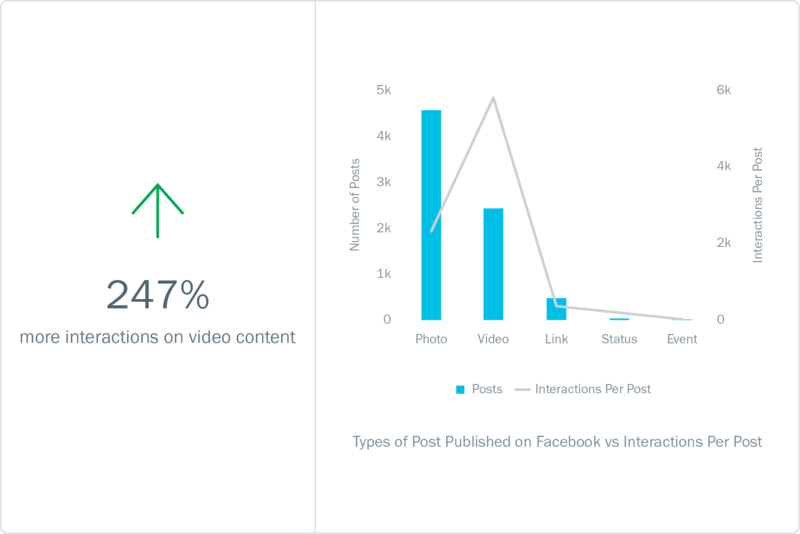 Brands are posting twice the number of photos on Facebook compared to videos, but videos get more than twice the number of interactions. Links have fallen out of favour amongst Australian retail brands and make up just 6.5% of total content published and account for less than 4.5% of all interactions. Statuses — or plain text updates have almost passed into obscurity. This is not a surprise as they have garnered an average of just 46 interactions per post in 2017. Brands need to put their content efforts behind what generates the greatest amount of engagement. 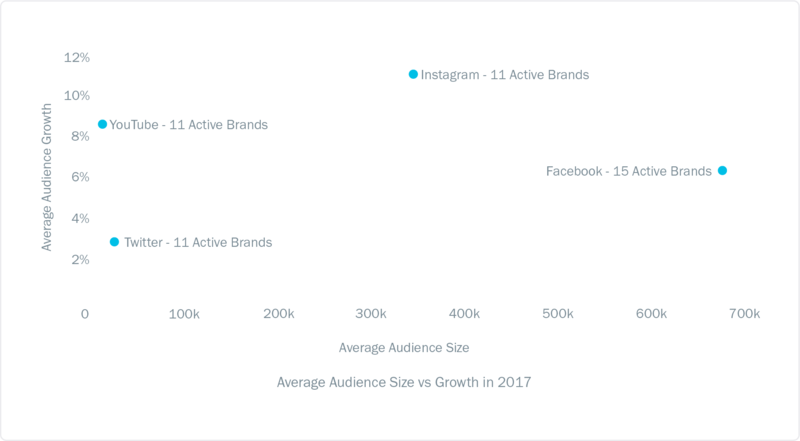 Although total interactions per post have steadily increased since 2015, this growth is being driven by Facebook alone. 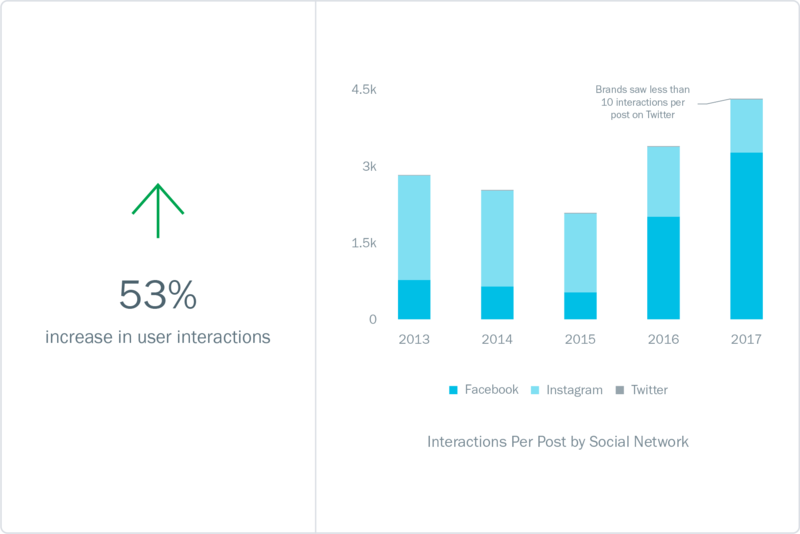 Interactions per post are up by 317% since 2013. On Instagram, user interactions per post have dropped by 49%. In 2013, posts generated an average of 2,000 interactions each, but this has dropped to 1,000 interactions in 2017. Twitter has been one of the worst social networks for brands to receive engagement. In 2017, brand tweets (which doesn’t include retweets or replies) saw an average of just 10 interactions per tweet. 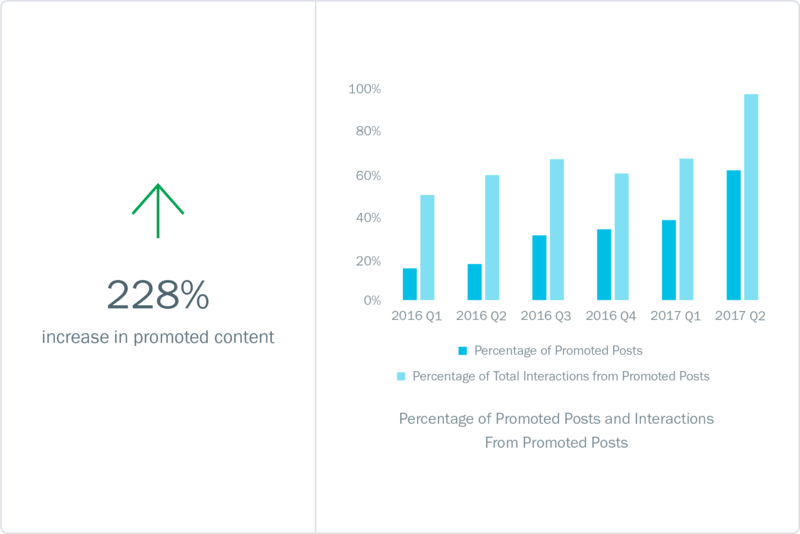 Even as the amount of content brands publish on Facebook has fallen, the number of posts that are being promoted has increased significantly. By the end of Q2 of 2017, 62% of Facebook content was promoted — up from just 17% in Q2 of 2016. 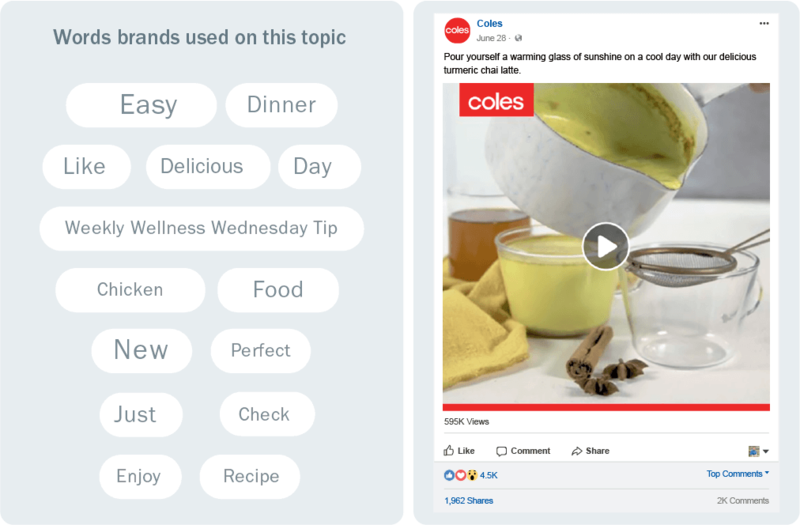 Today, content that has been promoted by Australian retail brands on Facebook accounts for a staggering 98% of all the recorded user interactions. This explains the 317% increase in interactions per post as discussed in trend 4. For many industries and regions, Twitter is an essential platform to provide immediate, real-time customer service. For Australian retail brands, using Twitter as a customer service platform peaked in 2014 and has been on the decline since. In 2014, each brand responded to nearly 3,000 tweets in four hours or less. 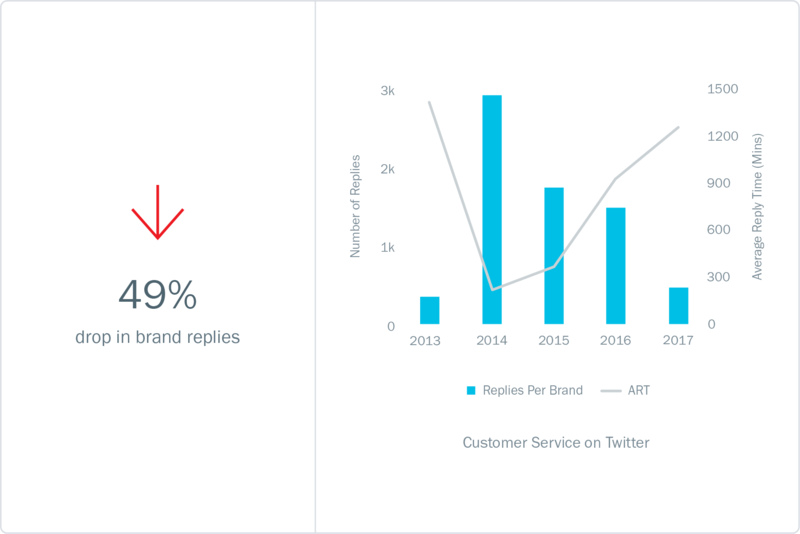 Although we’re only half-way through 2017, the downward trend in the number of replies and the increase in Average Reply Time (ART) indicates that Twitter has lost its lustre for retail brands. On average, customers have to wait almost a day to get a response. Australian retail brands are publishing fewer videos on YouTube, which is in sharp contrast to what they are doing on Facebook. 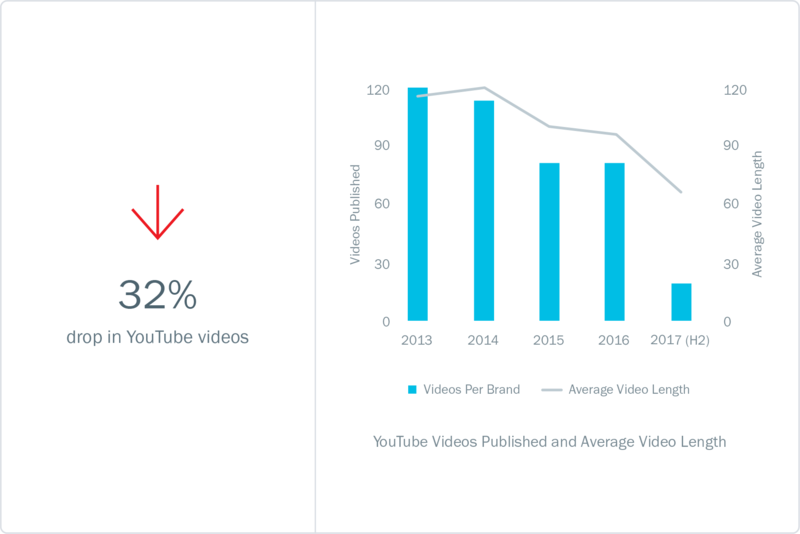 In the first half of 2017, an average of 19 videos were published per brand on YouTube. On Facebook, brands published an average of 162 videos each in the same time period. The length of videos published on YouTube is also decreasing. Facebook is becoming the go-to place for publishing videos as opposed to YouTube, especially for longer videos.